Ripstone and Lab42 have framed a spring release window for Snooker 19, which will come out on PS4, Xbox One, Switch, and PC. 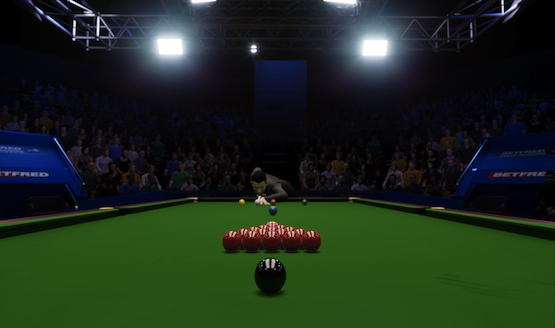 Developed in Unreal Engine 4, Snooker 19 is the first official tie in title (for World Snooker) to the popular sport for this generation with 128 players from all over the world. Snooker is like pool, with a number of key differences between the two games. The player who just recently became the first person to reach 1000 century breaks, Ronnie O’ Sullivan, will be in the game, alongside other world renowned snooker players Judd Trump, Mark Selby, and Ding Junhui. Each person has been 3D facial scanned for accuracy. Iconic locations known by snooker heads worldwide, such as The Crucible and the Alexandria Palace, are featured in Snooker 19, to add to the authenticity. All of these details come together with a variety of offline and online modes that link real-time with the World Snooker calendar. Included is a fully customizable selection of full snooker, 6-red snooker, and Shoot Out snooker game types, and quick play online match making. If you’re interested in giving this a try and live in the U.K., Snooker 19 will be available at the Powered by Unreal Engine booth in EGX Rezzed from April 4th-6th. If you’re wondering what else Lab42 has worked on, it helped port both Yakuza 0 and Yakuza Kiwami to PC, and it provided programming and production support to Football Manager Touch 2018 for its release on the Nintendo Switch.